A retailer told me, he says this is planned for May 2019. Which makes sense, since there will be a new Godzilla movie in May 2019. I'm sure the people who would be interested in such a thing, will find this quite interesting. Good for them! Many moons ago, I grabbed the DVD of this out of a $5 bin. As long as DVD is a playable format, I won't ever purchase this movie again. 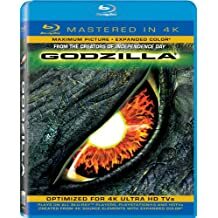 I'm currently happy with my Blu-ray of the film, but if Sony wants to do their 4K Magic on any of the other Godzilla films in their catalog, with improved subtitle translations, I might be interested! Part of me wants to get the 4K release but then part of me wants to not get it. I mean the movie is "ok" if you don't look at it as a Godzilla film but on the other hand the BD is serving its purpose for me too. Like lhb412 said if Sony wants to do the Toho Godzilla films they have a license to in 4K I'll gladly upgrade to those in a heartbeat. I will probably upgrade to Godzilla (14) when that gets its 4K release. Blah....not interested. lol Sony needs to do some more upgrading/improving on their toho godzilla catalog and release those instead. Speaking of which, don't some of the rights to some Heisei films Sony has expire this year? Could Sony even do 4K releases for the Toho films they have? I would think that Toho themselves would want to do domestic releases first that way Japanese customers don't import. KaiserGhidorah wrote: Blah....not interested. lol Sony needs to do some more upgrading/improving on their toho godzilla catalog and release those instead. Speaking of which, don't some of the rights to some Heisei films Sony has expire this year? According to Keith back in 2013, Godzilla vs. King Ghidorah and Godzilla vs. Monthra are up for renewal this year. The majority of their catalog is up for renewal in 2023, with a few up for renewal in 2025. Source. Yeah, I remember seeing that somewhere I just couldn't find it. Thanks for bringing that up. I expect Sony will probably renew the rights though but you never can tell....they did let all the showa films rights expire. I guess we'll see. I thought it was already on 4K? in fact , it was one of the earliest releases, so early, it doesn't even have the standard black 4K/BRD packaging. I believe that release is not a proper 4k UHD disc. Instead it's merely a regular Blu-ray with a 4k master and no special features to make room for the extra bitrate for the movie. I think there were a few movies released like this, and they were just a stopgap until the UHD spec was finalized. Heiseigodzilla425 wrote: I believe that release is not a proper 4k UHD disc. Instead it's merely a regular Blu-ray with a 4k master and no special features to make room for the extra bitrate for the movie. I think there were a few movies released like this, and they were just a stopgap until the UHD spec was finalized. That is correct. Its kinda like those Superbit DVDs that Sony put out in the mid 2000s before BD hit. This upcoming release would be a proper 4K release complete with the higher resolution and HDR support.